The Goods and Services Tax (GST) Council at its meeting here on Sunday reduced the GST rate on under-construction houses. For flats priced more than Rs 45 lakh, the new GST rate applicable from April 1, 2019, stands at 5 per cent, against 12 per cent currently. 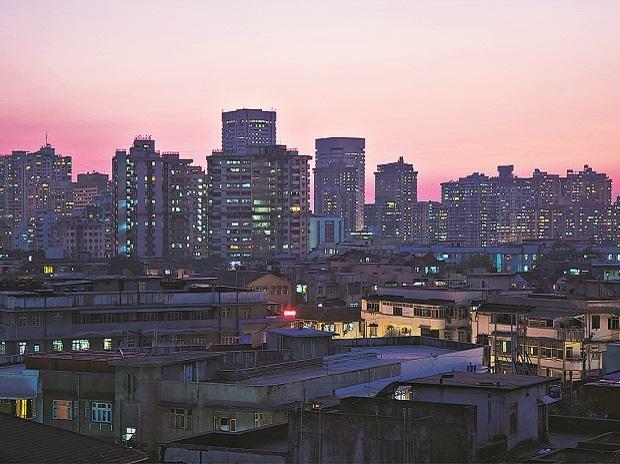 The Council also cut GST rates on affordable housing to 1 per cent, from the current 8 per cent — less than what the ministerial panel on real estate had suggested. In both cases, the builders will not be eligible to claim input tax credit in the new structure. Healthy competition between property sellers will ensure the rate reduction will slash the cost of under-construction flats in the next financial year, Finance Minister Arun Jaitley told reporters after the meeting. Most experts hailed the decision. “This decision can potentially reduce buyers’ payout by 4-6 per cent on the overall purchase price, depending upon the category,” Shishir Baijal, chairman & managing director (MD), Knight Frank India, said.Jaitley said this decision could help achieve the policy objective of ‘housing for all’ in the next three years. “This move will give fillip to apartments under construction in the country, and improve the flow of credit to the real estate sector,” he said. Affordable houses in metro cities would be 2 BHK flats, while those in non-metros would be close to 3 BHK apartments, Jaitley said. The Council adopted a twin definition for ‘affordable housing’, based on carpet area and cost. In metro cities, affordable house will be defined as a house with carpet area of up to 60 sq. m and priced less than Rs 45 lakh. In non-metros, a bigger flat of up to 90 sq. m would be considered affordable housing, with the cost cap unchanged at Rs 45 lakh. The definition does not consider the built-up area or the super built-up area, but the carpet area. “Affordable housing has been defined in a very liberal manner. About 95 per cent of flats in small cities and about a third in metros are affordable houses. 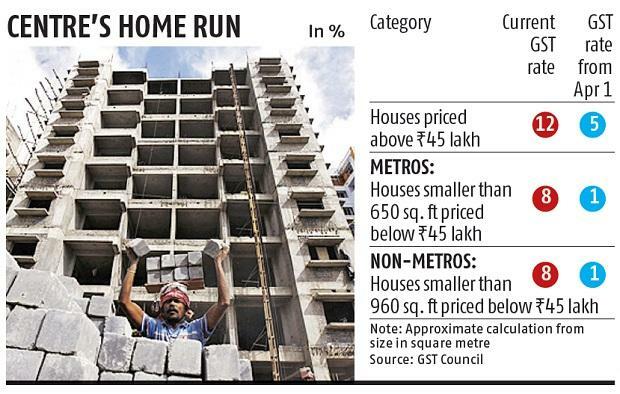 So, the aspirational class in smaller Indian cities would now pay only 1 per cent GST on under-construction flats they buy,” said a senior finance ministry official. Metro cities would include the Mumbai Metropolitan Region, National Capital Region (Delhi), Bengaluru, Kolkata, Hyderabad, and Chennai. Some industry players, however, are of the opinion that the input tax credit system should have continued. “Developers will be burdened with GST payments to vendors, suppliers, and contractors, which will increase the cost of houses amidst the already shrinking margin in the business,” said Parth Mehta, MD, Paradigm Realty. Many state finance ministers and officials had pointed out that the removal of input tax credit from the value chain would reintroduce the prevalence of cash transactions in the real estate sector. To address this issue, the law review committee and fitment committee would deliberate to put out a detailed circular. The Group of Ministers on real estate had recommended that at least 80 per cent of inputs should be procured from organised dealers. Jaitley said the committees will arrive at the proportion. But experts fear cash might make a comeback in the real estate ecosystem due to this. “Builders will no longer be bothered about bringing on record purchases of cement, steel, iron, paints, etc. This effectively means cash transactions could make a significant comeback in the sector,” said Atul Gupta, senior director, Deloitte India. The committees will also look at issues such as transfer of development rights, joint development agreements, lease premium, sale and transfer of floor space index, among other issues. The committees will also draft rules for the transition from the current system to the new one. Its recommendations would be finalised till March 10, which would later be approved by the Council in a meeting held via videoconference. The probable date for the next meeting is March 15. The stamp duty and registration and other charges remain as they are. Flats, which have received completion certificates, are out of the purview of GST. This rate reduction will not reduce the revenue of the government, Jaitley said, citing official calculations. However, some officials said a lot depends upon the increase in sales volumes. The decision on GST rates on lottery, however, was not taken at the meeting. Jaitley said the designated ministerial panel would meet once more to arrive at a consensus, acceding to requests from Kerala and Punjab.